Just taking a few moments to log some thoughts on task storage in Microsoft Operations Manager 2005 (MOM 2005). 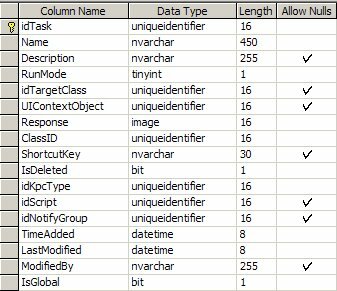 When tasks are stored in the MOM database, they are not actually stored in a hierarchy but have their hierarchy stored as a path (in a similar way to how reports are stored in SQL Server Reporting Services). When you look in the OnePoint database, you will find that the tasks actually appear in a table called "Task2" (and not in the table called "Task" that seems to be unused!). One of the consequences of how tasks are stored is when you release a update to a management pack that has some of the tasks removed. Because there is no hierarchy, when the management pack is deployed any tasks will be overwritten with their updated counterparts in the new management pack. However, if the new management pack has had some tasks removed from it, they will still be present in the deployed environment unless additional steps are taken to remove them. The easiest way to remove them is via a SQL script. In you management pack you will no doubt have created a folder for your tasks off the root, e.g. "My Tasks". All you would have to do is to run a script that deletes the tasks before the management pack is deployed, i.e. The scripted deployment of management packs will form another post, but if you do a scripted deployment you can run this SQL script before you deploy the management pack and you will find that all your tasks are cleanly deployed, including any that have been removed as part of the update. You need several tasks to execute the same command-line tool or script, but with different parameters (a recent example I had of this was to resume BizTalk orchestrations in an application, with a task for each type of orchestration. With the knowledge of the table structure above, you can get round this by either changing the name of the task to add a folder to the path, or you can copy task rows in the database, refresh the Admin Console and then edit them to change the parameters. In Microsoft Operations Manager 2005, tasks are a really powerful feature for systems management, but under the skin they are not as solid as you'd hope. Also, the edit and deployment of tasks has a couple of holes. You can plug these if you know whre to hack. Enjoy!